Literary Nonfiction. THE WRITER'S FIELD GUIDE offers a refreshing approach to the craft of fiction writing. It takes a single page from forty contemporary novels and short stories, identifies techniques used by the writers, and presents approachable exercises and prompts that allow anyone to put those techniques to immediate use in their own work. Encompassing everything from micro (how to "write pretty") to macro (how to "move through time space"), and even how to put all together on page one, this a field guide for anyone who wants to start writing now. "There comes a time in every writer's education when they realize they don't know what the hell they're doing. At this point, a writer can throw in the towel, take out student loans for another round of schooling, or discover a brilliant book like Michael Noll's THE WRITER'S FIELD GUIDE. 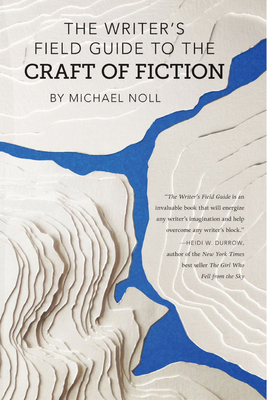 With patience, good humor, and fortitude, Noll provides a field manual for taking fiction apart and putting it back together again, gaining technical know-how and inspiration along the way. An indispensable book that belongs on every serious writer's desk." --Amanda Eyre Ward"These exercises are a true inspiration for both novice and experienced writers. THE WRITER'S FIELD GUIDE is an invaluable book that will energize any writer's imagination and help overcome any writer's block." --Heidi W. Durrow"Michael Noll, having grown up a curious, pragmatic Midwestern farm boy, now passes along some of his hard-earned fiction writing wisdom, freeing us from the 'Behold Genius-at-work' writing myths in the process. As a writer you'll still find yourself in awe of what Nabokov, Morrison, or Chekov do on the page, but Noll shines some new light on how fiction writers might reexamine story form, character, and language through an old but nearly forgotten method-close reading and imitation-and build their own entirely original works. Because there's less theory and more practice, we all benefit. 'Tell me a story, ' he quotes one of his former instructors urging, which seems simplistic until you look at how often we avoid doing just that. A terrific, truly curious book about the humbling practice of writing fiction." --Scott Blackwood"For years, Michael Noll's Read to Write Stories blog has been one of my favorite resources, period. Now, at last, along comes his WRITER'S FIELD GUIDE, in which reading and writing are rightly treated as inextricable, such that every sharp insight and lively provocation is rooted in the terra firma of great writing. Indeed, its primary text excerpts are impeccable, but it is also Noll's own intuition, reading acumen, and willingness to push beyond the obvious that ultimately make these exercises so worthwhile, and the book a gem." --Tim Horvath, author of Understories.